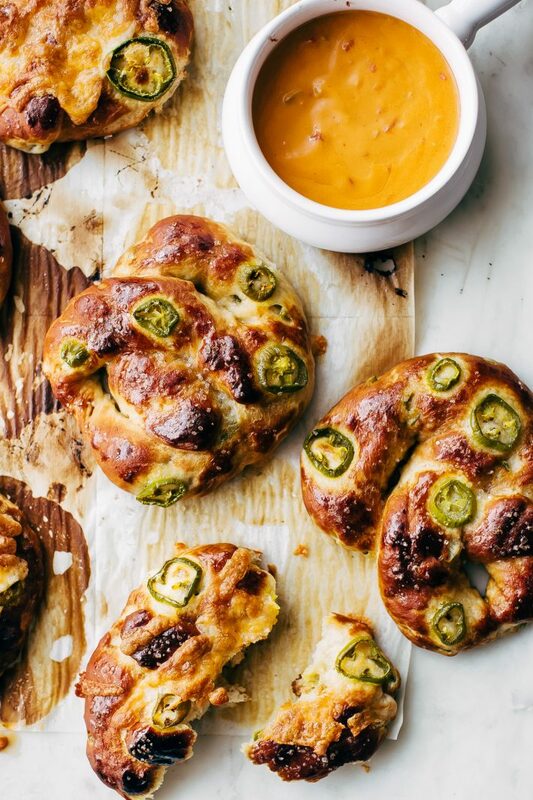 Homemade cheddar jalapeño soft pretzels so good people will think you got them from your favorite pretzel shop! 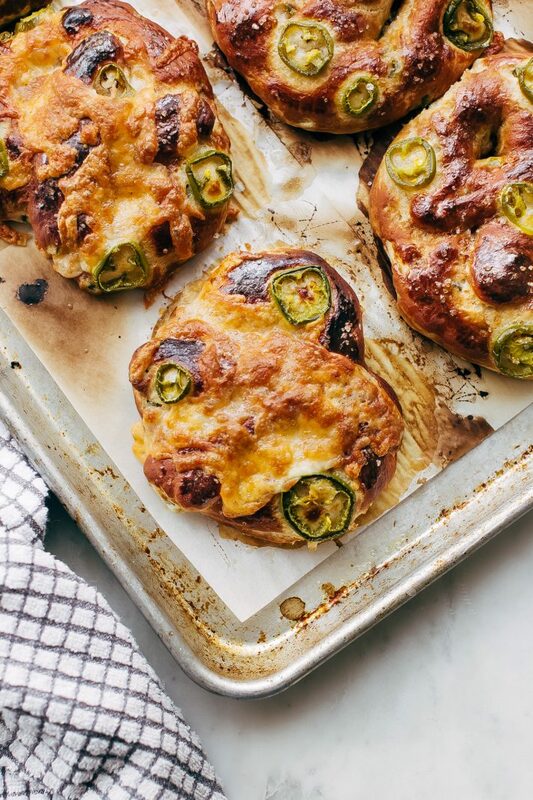 These are loaded with pickled jalapeños and topped with shredded cheddar on top! My jalepeño soft pretzels game is so strong it puts Auntie Anne’s to shame. Your eyes don’t deceive you; I really just said that. There’s something about those mall pretzels that get me every single time. It’s like right when you open the doors, that smell comes at you like a freight train just urging you to walk over, buy a pretzel, and [over]indulge in that pillowy soft dough topped with pickled peppers and tons of salt crystals. And nothing goes better with a pretzel than a cold icy sprite or coke to wash away all that salt. 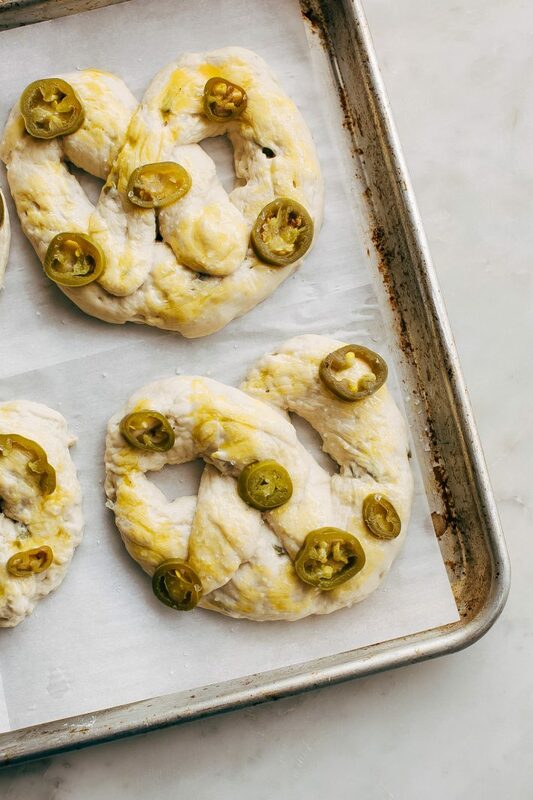 But would you believe me if I told you that YOU could make these jalapeño soft pretzels at home without breaking a sweat? 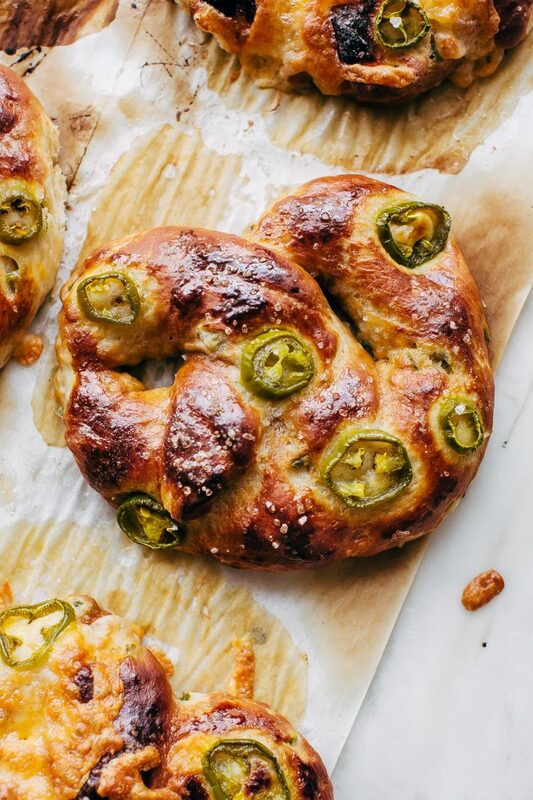 These are cheddar jalapeno soft pretzels, a step above your average ballpark variety and we’re even one-upping Auntie Anne’s because, when was the last time she added cheddar into the mix? Not any kind of pretzel I’ve had before, that’s for sure. And if that wasn’t enough, I’m going to tell you the absolute best thing to dip these pretzels in. Trust me; it’ll change your life. Soft pretzels and I go way back. I was probably the only kid in elementary school that opted for the jalapeño variety every time the opportunity presented itself. It didn’t stop there; they were a weekly staple for me back in high school when all my friends and I would pile into my little Civic after school and drive to the mall once a week for window shopping. I’m wise enough to admit now that I went more for the pretzels and less for quintessential teenage mall experience. They were my junk food of choice for dinner when I worked at local sporting events during the hot summer months. A soft pretzel was what my mom and I would split when that hankering for something salty came up when we shopped for back to school clothes. I’m passionate about this. Not a single summer went by without a soft pretzel from the mall. Homemade pretzels  first appeared on my blog eons ago, and I’ve only made that recipe ever since. They’re everything a good pretzel should be; golden and salty on the outside soft and chewy on the inside. And so easily customizable too. But over the years, I changed it up here and there. In went a handful of chopped jalapeños. Then came the ones on top. And finally, a handful of shredded cheddar was added on for some extra golden deliciousness. And that’s how these cheddar jalapeño pretzels were born. Like any dough made with yeast, we’ll activate the starter first. To do so, you’ll combine the warm milk, yeast, butter, and brown sugar in a medium bowl or measuring up and let it hang out for 10 minutes. The brown sugar feeds the yeast, and the warm milk provides the ideal environment for the yeast to bloom. Make sure the milk isn’t hot. If it feels hot on your finger, it’s too hot for the yeast. If after 10 minutes the yeast isn’t bubbly or foamy at all, it’s most likely gone bad, or the milk was too hot, and it may have killed the yeast. 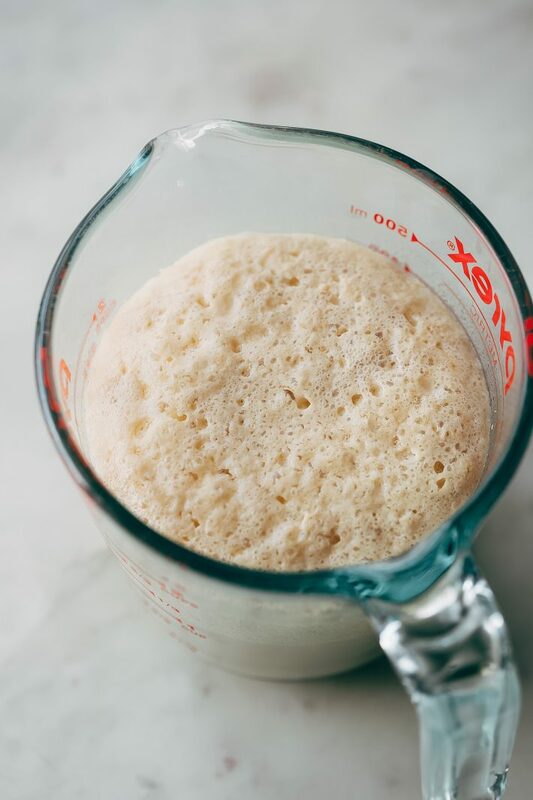 You’ll need to get fresh yeast before proceeding or use cooler milk next time. Once the yeast blooms, we’ll stir in the remaining pretzel ingredients and bring together the dough with a wooden spoon. This is where you’d add your chopped jalapenos. I used the tamed pickled peppers you find in a jar. Just be sure to remove them from the liquid, pat them on a paper towel and then chop them up before you add them to the dough. Dump it out onto a clean floured counter and continue to knead it about 5-10 times or until it comes together. Then just pop it into an oiled bowl, cover and sit back for an hour and let the dough rise. Once the dough rises, we’ll shape the pretzels into their iconic shape and then dunk them in a hot baking soda solution. Heat roughly 3 cups of hot water in a medium pot and add the baking soda to the water. You’ll notice it starts sizzling. Dunk the prepared pretzels into the baking soda bath for just about 10 seconds using a slotted spoon. Then quickly remove and place them on your baking sheet. Now brush them with the beaten egg yolk and sprinkle them with coarse salt; add a few pickled jalapenos on top for looks. If you’re extra fancy, pile on a decent amount of shredded cheddar cheese on top. I like to use freshly shredded cheese here as it melts beautifully! Bake the pretzels until their golden on top, in the ballpark of 10-12 minutes. Once the pretzels are hot out of the oven, you can brush them with the remaining melted butter. You can see in the picture that I added cheddar cheese on to only half of the jalapeño soft pretzels. I still feel like I slightly prefer them without the cheese but hubby is convinced cheddar cheese pretzels are the way to go. And I’ll let you decide how you like yours. 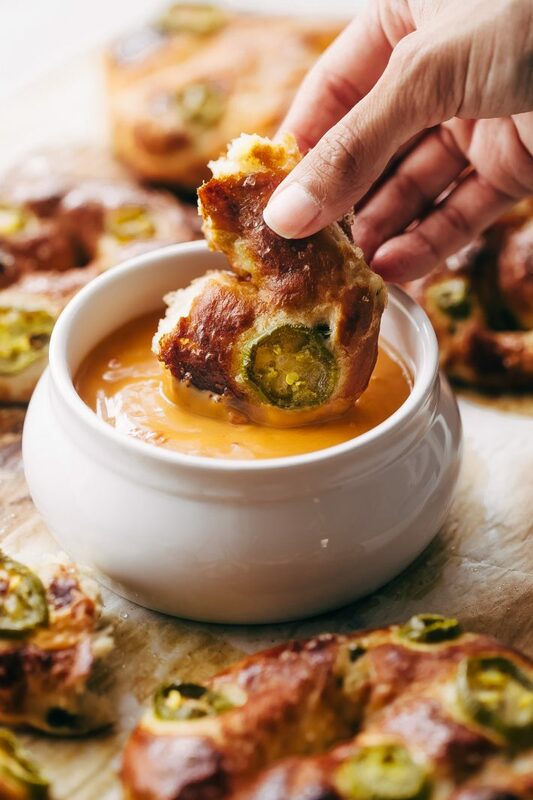 And now let me tell you what to serve these jalapeno pretzels with. 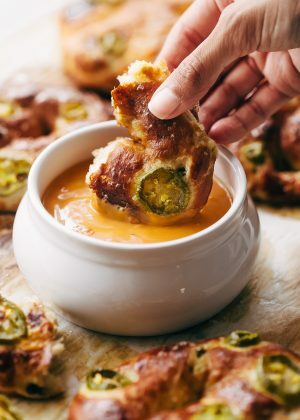 Regardless of whether you decide to pile cheddar on top of your pretzel or not, you need to serve these with salsa con queso. Seriously! You can make it at home, or you can buy your favorite jar of this stuff. My local grocery store sells their packaged version of this and OMG. I will never eat a soft pretzel without it. Just warm it up while your pretzels are baking and serve them straight out of the oven with melty queso. 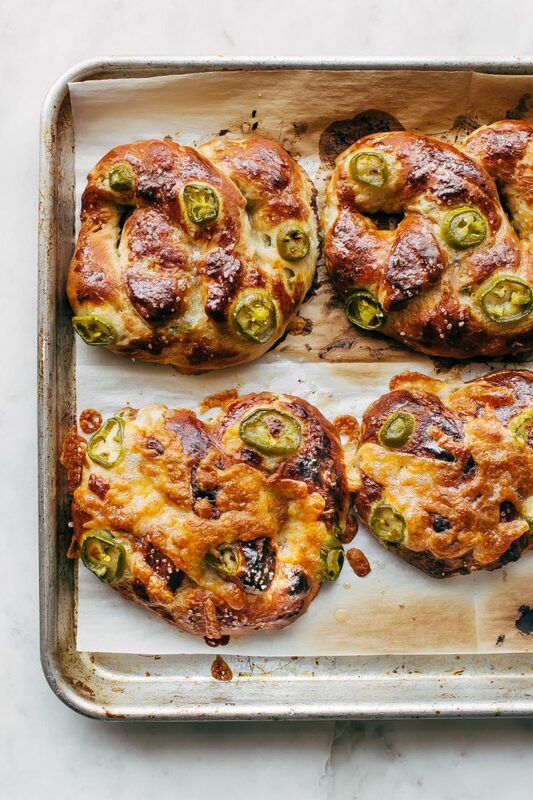 Jalapeno soft pretzels are a summertime staple for me, and I hope that you’ll find an afternoon and put these together with someone you love. MAKE THE DOUGH: Be sure to drain the jalapeno peppers and dry them on a paper towel. Then just chop them up and set them aside for now. In a large mixing bowl, combine the milk, yeast, sugar and 2 tablespoons of butter and let sit for 10 minutes until the yeast activates. Stir in the salt then the flour and jalapeño and allow a dough to form, mixing for just 1-3 minutes until the dough comes together. MAKE THE PRETZEL: Dumb the dough out onto a floured work surface and knead. If the dough is too sticky add a tablespoon of flour at a time until the dough can easily be kneaded but is still slightly tacky. Knead a total of 5-10 times. 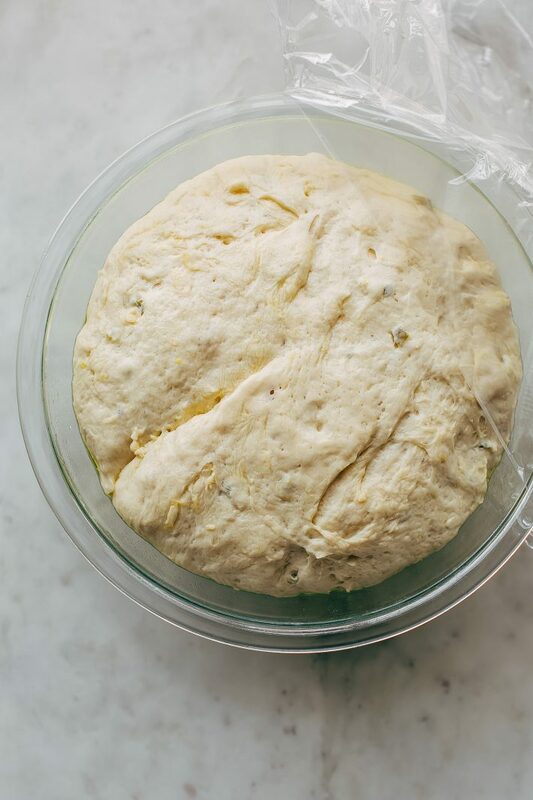 Add to an oiled bowl, cover and let the dough rise for an hour. PRETZEL BATH: Position a rack in the center of the oven and preheat the oven to 450ºF. After the dough rises, punch down the dough and divide the dough out into 6-8 equal pieces (depending on preferred size) Roll out into a long, skinny rope, like close to 24 inches. Fold the ends into to make a pretzel shape. You can twist the center if you’d like, I was too lazy to deal. BAKE: Heat a medium pot with water when it’s hot, add the baking soda and stir. Gently dip each pretzel into the baking soda mixture using a slotted spoon for 10 seconds. Remove and arrange pretzel on a baking sheet. Brush with the beaten egg yolk and sprinkle with coarse salt if desired and top with additional jalapenos and shredded cheese. You can use cheese on 1/2 of them like I did, or all of them; your call! Bake until golden, 10-12 minutes (closer to 10 mins if you’ve made 8 pretzels.) Brush the pretzels with the remaining melted butter and serve warm with salsa con queso! You can use tamed or hot peppers for this, either will work. I went the tamed route because I like it more for flavor than heat!